This is an odd article for me to write. I’ve been an advocate of crowdfunders using Amazon fulfillment (instead of shipping by hand) since the early days of Stonemaier Games. I also like to keep this blog largely positive. But I also feel a responsibility to my fellow creators, especially when I’ve lauded something in the past. I’m willing to learn from things the hard way so you don’t have to, and this is one of those cases. I’ve been moving away from Amazon multi-channel fulfillment for a while now. This is when you sell something on a non-Amazon website (like Kickstarter) and then just use Amazon’s fulfillment service to send your product to customers. It’s still a decent, cost-effective service, but I’ve found it doesn’t work well for premium products that require proper packaging to be delivered undamaged. One of the perks of Amazon multi-channel fulfillment is that it also makes it really easy to sell your remaining products (i.e., after Kickstarter rewards are delivered) via Amazon FBA. This is when you sell something on Amazon’s website and Amazon fulfills it. Unfortunately, there is a hidden catch to this service. I’ve been aware of this for a while, but until recently I didn’t realize just how frustrating it is. That’s why I’m writing this article, and that’s why I’ll no longer be using Amazon FBA after I sell out of my current inventory there. I’m not just talking about Amazon.com–I’m talking about Amazon.ca, Amazon.de, and Amazon.co.uk. Now, as will be clear in a minute, Greater Than Games had nothing to do with this. I can even understand the confusion–Greater Than Games is our distribution broker. Rather, what had happened is that another retailer had made an honest mistake when listing their copies of Tuscany on Amazon. They bought the copies from Greater Than Games and assumed that they were also the publisher, and they listed the game as such on Amazon. I don’t blame the seller for this mistake–it’s just human error. The problem, though, is that Amazon allows retailers to change product pages created by the publisher. This shouldn’t even be an option, exactly because of the possibility of human error. The product page already existed–the only thing a retailer should be able to do is select that page and choose a price and quantity for their copies of the game. Now, anyone can create a product page on Amazon. It’s not like the publisher always does this before a retailer does. But that wasn’t the case here. I created the product page. Even this is not the most frustrating thing. By far the most frustrating thing is when I contacted Amazon.ca about this error, they told me that they could only correct the name of the product if requested by the retailer. This is despite them clearly showing in their records that I created the product page in the first place. I also provided links to prove that I publish the game. Heck, my name is on the box! But that wasn’t good enough. So I had to track down the retailer–which could have been any number of retailers, as it’s not like there’s just one dude selling Tuscany in Canada–and ask them to ask Amazon to change the name of my product. Same thing as the Tuscany error. A retailer had accidentally typed in the wrong player count, and Amazon had no problem with that. I’m not sure who made the mistake, and it doesn’t matter–I truly don’t blame the retailers. It’s human error that can be avoided by simply not giving them the power to change the data on a project page created by the publisher. Again, Amazon wouldn’t let me change the data, and I didn’t know who the retailer was that made the error. All I knew is that Cape Fear Games is the current retailer, and they’re awesome, so I reached out to them to ask them to ask Amazon to fix the error. And they did. So, here’s the big question: Despite this epic loophole in Amazon FBA’s system, is it still worth selling through Amazon? After all, it’s a huge online retailer, and even if you don’t sell through them (as a publisher), retailers could continue to accidentally misrepresent your product on Amazon. For me, the answer is no. Not until Amazon adds safeguards to prevent retailers from changing a publisher’s data AND a system for verifying publishers and allowing them to change product page data without submitting a special request (to the retailer or to Amazon). The answer might be different for you, and that’s okay. But I wanted to let you know about this, and if you’re already selling through Amazon, you should check your product pages on a regular basis. You never know when someone is going to edit them. I suspect the problem is due to contracts with sellers. If publishers could change a retailer’s listing, then Amazon could not hold the seller responsible for false advertising. But don’t you think the creator of the product page should be notified if the page is changed by anyone else? I mean, wouldn’t that at least provide a feedback loop to allow the publisher to contact the updating entity to correct issues? Tim, I do think there’s a lot going on here, but Andrew is right–at the very least, the publisher should be updated when someone changes or attempts to change a listing. I’ve seen that with books. As a consumer, I’ve reported inaccuracies to Amazon and shared links to the publisher’s page that has the correct information, but had to wait until a “Review team” compared the listings. It took three attempts to get the correct information listed, and they had all of the correct information from the publisher’s webpage. For example, they have a problem with multi-volume sets, where they assume that it is one, extremely large volume. hey are shrinkwrapped book sets, but instead of sending the full set (as the listing is supposed to be) they open the shrink wrap, and just send the first volume. I don’t know why they have this massive disconnect sometimes. David: Thanks for being a part of the solution–even though it’s frustrating, that makes a big difference. I believe the difference here is between the Amazon Vendor system and the Amazon Seller system. When you create the product as a seller, Amazon treats you as one of many possible sellers. But a product can only have one Vendor in the Vendor system, and that Vendor owns the listing in a much stronger way than any of the sellers. Anything the Vendor specifies overrides what the individual Sellers specify. Randy: Thanks for your thoughts about this. I’m curious why Amazon doesn’t view Stonemaier as the vendor (since we’re the publisher and we created the listing)–perhaps there’s some box I should be checking. The Vendor system is meant for people who sell products directly to Amazon and then Amazon sells them to customers as the retailer. When you do that, you as the Vendor own the listing. (For example, Cape Fear Games can’t go change information on the Five Tribes listing because Days of Wonder is the Vendor. I don’t know as much as I would like about the Vendor system because PSI manages that for us.) I have heard stories from other publishers whose listing get associated with someone else’s Vendor account, and it takes far too long to get that fixed. As best as I have been able to tell, the Seller system doesn’t have a way for one seller to have any priority over another seller. Randy: Ah, I see. So it sounds like the really need something that’s in between Vendor and Seller (what I would call “Publisher”). I am from México, and just bought Viticulture and Tuscany, Amazon sent me the games just charging me $20 USD vs $68 usd other stores charged me or just didnt shipped to México. I wouldnt be able to buy it if Amazon did not selled it, which is a shame. If the information is wrong, I as a buyer check the info normally with the publisher, because I know those error on Amazon are possible. I can completely understand you not wanting to give business to Amazon FBA over this issue. However even with you not stocking product with them, other sellers are going to be able to do stock product with them and make changes as they have been, and it doesn’t solve the issue at hand. Its probably going to take weekly monitoring of these sites to make sure they have accurate information in order to protect your brand. One solution might be to see what other publishers are doing to prevent this, and maybe even come to amazon as a group, to see about fixing the problem. Sean: Yeah, I touch upon that near the end of the article. I guess I just don’t want to be a part of the problem any longer, and I don’t know what the solution is. If you truly do not wish your product to appear on Amazon at all, you could use DMCA to request removal of pages created by other retailers. You are still the copyright holder of the game’s image and any ad-copy you’ve written. This would still require monitoring the site for newly created listings. There’s typically no preemptive form of DMCA. There are specific fair use exemptions that have been recognized by the courts regarding the sale of items made by a third-party, as regards using their intellectual property to do so. Wholesale ripping off of a product page from stonemaiergames.com would probably be out of bounds, but using a picture of the box probably wouldn’t be, since there is no way to show a person a picture of the game they are buying without using the copyrighted box cover. Quoting from the back of the box could get into more of a grey area, but facts such as number of players that can use the product would not (to my knowledge) be able to be copyrighted. There are other legal avenues for challenging incorrect information, as it is potentially damaging to a publisher if the wrong information is given. “This game will make you bleed internally” is probably pretty damaging if presented as fact (as opposed to parody or sarcasm) and would be subject to action under other, non-copyright-related laws. I’m curious to know if you think a similar image and branding issue exists on BGG as well. For as prominent a place it holds in the industry, it seems that it is quite easy for users to add their own content to a game listing, like photos, documents, or (sometimes even more damaging to a brand) “reviews” of unpublished or unfinished games…similar to the way retailers can create Amazon listings with erroneous data. And it seems exceptionally difficult and slow for brand managers/publishers/inventors to maintain some authority over how the game is listed. John: Thanks for your comment. That’s an interesting correlation to BGG. I guess I consider BGG to be more of a collaborative environment, and if someone incorrectly edits one of my game pages, it’s pretty easy for me to edit it back to the original (the volunteers who approve edits are really good with stuff like that, while that was NOT my experience with Amazon). And I suppose this all could seem like an unrelated rant, but the common theme seems to be relying on ubiquitous resources to help sell/distribute/promote games, and sometimes they fail us. Your article made me think of friends who had successful Kickstarters only to have playtesters (or random strangers who haven’t even played the games) hop on BGG to post negative reviews of unfinished versions before backers got their copies, which at best is inappropriate and at worst damaging to a brand. I’m used to more immediate satisfaction in web design/social media, so waiting for human moderators to approval “official” content at BGG can be frustrating. Wade: Thanks for the tip! To my knowledge I haven’t done that, but it sounds like it could make a big difference. I’m going to sign up right now. Hey Jamey, have you heard anything more on Send From China? Still can’t find too many fulfillment reviews on these guys. PMD: I don’t have experience with them, but I do have a guest post from a fellow creator about their recent experience with Send from China going up next week. Zaz!!! That is awful, the good part is that you learned something and you shared that knowledge so everyone with a product in amazon can be ready to ask for the changes to be re done. Thanks for sharing a really interesting and frustrating use case, Jamey. Their data governance seems to be out of whack here – assuming the producer/publisher is not the seller, at what point does the publisher’s property end and the seller’s begin? I’d think that the publisher would be responsible for the bulk of an item’s contents, and the seller responsible for the price and shipping. There’s not even a question of repackaging (ie, if I, the seller, wanted to sell a box set of Stonemaier Classics that includes Viticulture, Tuscany and Euphoria all in one box) because the publisher generally has the right to specify the minimum product size (as Costco and Sam’s Club often do with bulk packages that have a sticker on each item indicating it is not labeled for individual sale). By signing up for the Brand Registry, are you going to give Amazon FBA one more try? The brand registry process has been…decent. It’s still overly complicated like everything on Amazon, and it’s hard to tell how much control I have over anything. It’s definitely not enough for Amazon FBA to appeal to me again, but I think I will continue to try to figure out and use the brand registry to protect the Stonemaier brand as resellers sell our stuff on Amazon. I had a big long reply typed out and somehow it timed out, and I’m not going to retype. But the short version is that the right you refer to does not exist outside of a specific contract between you and the seller that says otherwise, and the “individual sale” labeling is often more about not having to label individual packages with nutrition or other legally-required information than anything else. And selling a “box set” of Stonemaier Games games generally is permissible under US law, with some caveats about how you chose to present the entity responsible for the box set. Again, subject to any contracts between you and the entity you bought them from. But a (hypothetical) contract between Stonemaier and JT does not confer any contractual responsibility on a sale between JT and me, so even if your purchase contract with Stonemaier says “no reselling as a box set”, I’m under no such obligation. One question for me is, does the benefit of using Amazon to warehouse and fulfill your orders outweigh a few bad listings or vice versa? That’s one side, the actual fulfillment of orders. Does Amazon do a decent job at fulfillment? To me this is different than product listings on their website. You mentioned you haven’t been completely satisfied with their fulfillment either because of damage claims. What service/company are you going to use after Amazon? The other side is how many sales will you lose by doing this? Sure, a few people have had issues, and it is clear that the product pages have not been up to par, but how many orders went through without a hitch despite this? How many more would go through if the information was correct? How many people know they want the game because of 3rd party reviews and don’t really pay any attention to the info on Amazon? Sure, click on that link in the third paragraph and you’ll see if I’m satisfied with their fulfillment service (which is different than FBA). 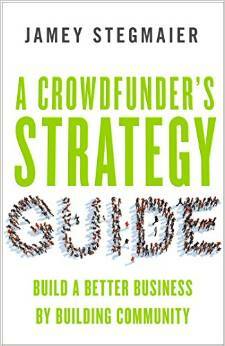 It’s impossible to calculate the impact of the misinformation spread by incorrect listings. 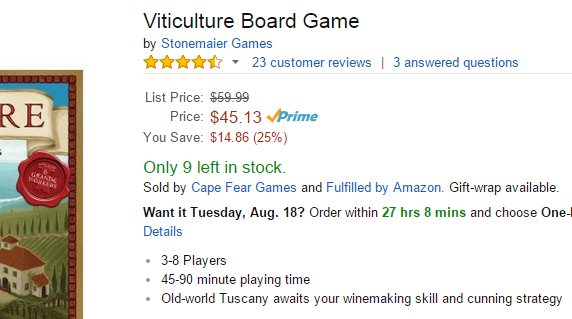 Having Viticulture listed as a 3-8 player game for several months could have had a significant impact–I don’t really know. Thoughts on better monitoring your product listings? Perhaps outsourcing that task? I realize that isn’t a solution to the issue at hand, more of a band-aid, but I would worry about lost sales too much I think to just pull the plug. The frustration of having to deal with Amazon on these issues that seem out of your control, and then having them not be helpful, must be extremely high. Have you settled on an alternative? I don’t sell many direct products anyway (post-Kickstarter), as it’s much more efficient to sell to distributors. So I’ll continue to focus on that side of the business. As for monitoring the product listings, it’s hard to do, as I have a number of SKUs at Amazon, Amazon.ca, Amazon.co.uk, and Amazon.de. I could pay someone to check them all on a weekly basis, and we’d probably catch some mistakes. But it doesn’t fix how poorly Amazon responded to my request to fix it. It took them weeks to take action. I feel your pain. The King’s Armory was recently listed on Amazon by myself. YAY! – 2 weeks later retailers got the game and someone listed it and put their own description which was cut and pasted from BGG. – Not only was the BGG description overwritten by a user shortly before (so it’s a 3rd party description now), it’s also too long for Amazon, so it gets cut off halfway through. I’m sorry to hear that, John! That’s rough. I just got my game into Amazon’s FBA program. And I’m having a ton of problems with them myself; this will probably be the last time I’ll use them. I figured, I’ll keep my offer suppressed, and I won’t have this problem. Right? Wrong! I woke up this morning to my product having a completely different (and misleadingly-incorrect) name, even though no one else should be able to see it. So now my shipping invoices will look weird. And I can’t even tell who changed my product’s metadata! Jamey, who will you use for fulfillment instead of Amazon? As you can imagine, I’m currently looking for alternatives myself. Gil: I’m sorry to hear you’ve been experiencing similar problems with Amazon FBA. I would recommend trying the “brand registry” thing someone mentioned in the comments above. I can’t tell if it’s actually helped me at all since doing it, but it is a thing you can do. I’m testing out Funagain Games fulfillment with Between Two Cities and the new treasure chests. From what I can tell, they’re extremely responsive, transparent, and good at packing games. While they haven’t shipped anything for us yet, I’ve had a great experience with them so far. That’s great to hear; they were already on my shortlist! I’m struggling with trying to estimate shipping from the plant [Panda] to the various fulfillment centers [especially since I don’t have weights or addresses for various distribution depots around the world yet]. I’m considering using FunAgain and Spiral and bypassing Amazon altogether based on your most recent advice. I’m sure you’ve covered this, but I can’t seem to find it for the life of me. Is there something I’m missing? Is there a formula for estimating this portion of the budget? I’m also having some challenges in determining if I will have plenty of room to fit all of the components in my box. I noticed that you said you were looking at making the box for Scythe deeper at one point due to space concerns. If I needed to make an adjustment like this in the future, how much does an adjustment of this nature effect your original quote? Brent: Thanks for your questions. To get freight shipping estimates, contact Justin at OTX (jbergeron@bos.otxusa.com). He’s worked with Panda (and Stonemaier) many times–he knows his stuff. However, he’s not going to be able to tell you much if you don’t have the approximate size or weight of the game. Here’s how box size impacts a freight shipping quote: Typically, 48 cartons can fit onto a pallet. So the number of games that can fit into each carton has an impact on the number of games that fit on a pallet. In terms of cost, this matters most when it’s a big game. For Scythe, we made the box as big as possible while still fitting 4 games per carton (192 games/pallet). If we even added a few millimeters to each game box, those cartons would only be able to fit 3 games (144 games/pallet). However, if it’s the difference between 8 or 9 games per carton, increasing the size of the box a little bit doesn’t matter much. I have the box size that I want to use, but the weight would only be based off of the prototypes that I’ve created myself and not the actual product. I was concerned that an an underestimate in weight could add up quickly. What were the final box dimensions of Scythe? Sure, you should overestimate on weight just in case. Scythe’s dimensions are 300 x 365 x 98mm, if you’re estimating how many games fit in a carton, talk to Panda about your game (don’t try to estimate it based on Scythe). Absolutely. I was just wanting to have the measurements as a frame of reference. Thanks! +1 for Brand Registry. With it, you control the listing and can modify it at any time using a spreadsheet that you upload. I’m not completely sure if it prevents others from making changes (never had that happen to me) but if it ever did, you could overwrite the changes immediately. Back after a large custody battle with Amazon over my children (products). “BRAND REGISTRY” is 100% the solution to your problem. It’s not an easy road (easier in EU actually), but it works. It means that Amazon acknowledges once and for all that you OWN the BRAND, therefore what YOU say is final. This goes for every detail of the listing. All others can change thereafter is their own “offer” ie: price. So, once you convince them that you’re legit (which isn’t easy), your listings belong to you and can’t be changed. NOW, if they’ve already been changed, changing them back is a hassle. So I suggest registering your Brand the moment you have your first product able to be listed (if you can). To fix existing errors you can use seller support to try to find someone willing and able (rarely both at once) willing to revert them for you, or you can go in and retype your own entries (add a “.”?) and save it. That will reset it to yours and lock it. If you need to change the image (oh dear has that been horrifying what some retailers changed our images to), you need to rename the image file, replace the first image AND a 2nd, then save it. That works 90% of the time. I still have 3 listings that have the wrong image loading on some search screens, and the amazon team trying to fix it. Overall, the hassle is the fault of careless retailers throwing nonsense up even though Amazon warns them “a similar listing already exists”; they override it with careless listings. Shame on them for not listing their own products correctly, or looking to see if the existing listing is accurate. Regardless, the work of fixing, and securing it, is on us. All in all, the sales made through FBA have been more than worth the hassle, and the profit margin over distribution is also notably higher. Not easy to use per-say, and very very time consuming (probably why retailers just throw trash listings up there), but ultimately worth it if you have a product that moves. John: Thanks for following up with this detailed comment! I did sign up for brand registry on one of the Amazons (it’s been a while–it was either Canada or the US), but the process was quite arduous, and I couldn’t see myself spending the time to do it for every variation of Amazon worldwide. I wish they were a little more centralized so you only need to do it once.